1.What is your favorite animal? 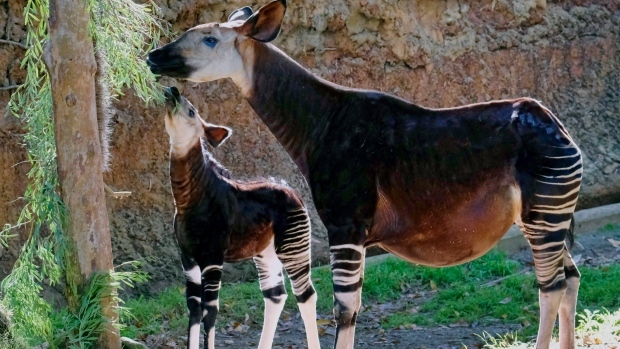 My favorite zoo animal is the okapi. They are gentle, shy and look absolutely magical. 2.Your dream vacation? I'd love to visit Washington DC with my nephew. 3.Last person's house you were in? My downstairs neighbor Brian. 4.Worst injury you've ever had? Last month, I fell in a ditch, leaving my legs bruised and bloody. I don't know that it was the worst injury I ever had, but it was the most embarrassing. 5.Last play you saw? Escape to Margaritaville with my friend Barb. 6.Ever go to camp? Yes, often throughout grade school and junior high. 7.Were you an honor roll student in school? Never. You're talking to a solid C student. 8.What do you want to know about the future? Will I be moving in 2019? 9.Are you wearing any perfume or cologne? Not right now. 10.Are you due sometime this year for a doctor's visit? I am going to get my eyes checked next week. I need new glasses. 11.Where is your best friend? In a really bad place. 12.Do you have a tan? Nope. 13.What are you listening to right now? My cat Connie is trying to get my attention. 15.Who is the biggest gossiper you know? Me, I suppose. 17.What does your last text message say? WHAT ARE U DOING ON YR BDAY? 19.Do you need to do laundry? Nope. Did two loads on Saturday. 20.What is your heritage? 92% German, 8% Irish. So read the confirmation that my four-day pass was on the way. I'm going to the TCM Classic Film Festival! Four days of old movies shown on big screens in Hollywood movie palaces, like the TCL Chinese* and the Egyptian. Four days of interviews and lectures about how these classics were made. Four days of getting my geek on with my fellow geeks -- including Will and Betty from my local classic movie Meetup. Yes, Chicago will be represented well represented in Hollywood this year! Some of the big movies have already been announced -- Gone with the Wind, Butch Cassidy and the Sundance Kid, and From Here to Eternity. I'm crazy about all three of them. But the one I'm super excited about is the restoration Holiday. 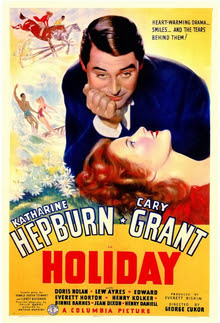 Holiday (1938) is my favorite Katharine Hepburn movie, which makes it one of my favorite movies of all time. And yet it doesn't get the love it deserves. Hopefully the spotlight it receives at the Festival will rectify that. Kate plays Linda Seton. She's rich, sheltered, and confused. The alienated black sheep of a prominent New York family. She wants to do good in the world, but is confused about how. She just knows that she's not content with the way her family and their friends worship the almighty buck. Her kid sister, Julia, brings home a most fascinating chap. Johnny Case (Cary Grant). Julia and Johnny met and fell madly, instantly in love on the slopes in Lake Placid. Now that they're home from vacation, Julia and Johnny have to deal with the reality of their lives. Julia is a Park Avenue heiress who (unlike Linda) loves her life of privilege. Johnny is a self-made success, who believes that money is the means to an end. Now that he has some money socked away, Johnny wants to take time off and spend it. He wants to travel and meet people, learn the meaning of life. Julia is appalled, but Linda thinks this is fantastic! Loving her sister as she does, Linda wants the wedding to take place. She believes Johnny is just what the Seton family needs. Susan wants Johnny, because he's clever and good looking, but she wants to change him into a Seton. Oh, yeah. And Linda is falling in love with him. This causes her much pain, because he belongs to her dear Julia. I always adore Hepburn, but I especially adore her in this clip. Has unrequited love ever danced across anyone's face like it does hers? The movie bombed at the box office because, in 1938, someone like Johnny turning down a bank job and money seemed foolish and insensitive. One in five Americans was unemployed, and a good job was considered the key to a bright future, not something to be scoffed at. But this spring, Holiday gets another chance to enthrall audiences. I'm going to be there, sitting in the dark with my popcorn, watching Hepburn weave her spell. See you in Hollywood this April, Kate! *You know, the one with the footprints in front.